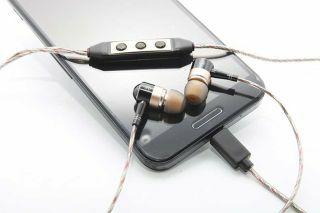 Zorloo unveils "world's first" digital earphones with built-in DAC | What Hi-Fi? Zorloo has announced the launch of the "world's first" fully digital earphones (though we might dispute that) with a built-in DAC and high-powered amplifier – a concept that's already proved a resounding success judging by its Indiegogo campaign. Z:ero is the name of these groundbreaking buds, which have secured funding worth US$50,000 through the crowdfunding platform, which is more than double the initial US$20,000 target with still over a month left to run. The aim of Z:ero, says Zorloo, is to recreate hi-fi music from an Android-powered device without the need for an external DAC or headphone amp – instead drawing "pure digital audio" from the mobile's USB port. All the Z:ero components have been fitted onto a miniature Printed Circuit Board that fits inside the earphones' control box. Zorloo believes "carefully picking the right architecture" has made this downscaling possible. Neodymium magnets are used to deliver high sensitivity, up to 110-120db, while aluminium is used to make the driver casing. And with the headphone amp built into Z:ero, output power is increased to 27mW (compared to the 12mW power that most smartphones are able to deliver), boosting the overall power output of your device. There's also a free carry case that comes with the Z:ero earphones. Z:ero is currently compatible with Android devices such as Sony's flagship Xperia handsets, the Google Nexus 5 and leading Samsung devices, but fundraising success means an iOS version is in the pipeline. It's hoped that reaching Zorloo's first stretch goal of US$50,000 will see that iOS version make its debut in Q3 2015. Meanwhile, further success could lead to a version capable of supporting 24-bit/192kHz audio. Zorloo says Z:ero will be priced between $25 and $35 once it hits the shelves, with the company due to start mass production in March before shipping to Indiegogo supporters in April. You can find out more here.